Home > STAINLESS STEEL CASTERS > STAINLESS STEEL PLATE MOUNT (S304 STAINLESS) > LIGHT DUTY - 3" thru 5" - up to 350 lbs - Plate Size - 2-3/8" x 3-5/8"
Caster HQ's stainless steel Light Duty Series is one of our most popular series offering the same advantages of quality, durability, and economical pricing in comparison to other brands. All metal parts of this series are made of 304 stainless steel, especially made for sanitary applications and long service life; offering exceptional resistance against rust and corrosion and are 100% washable, steam cleanable and safe for use in autoclaves when applicable wheels are used. 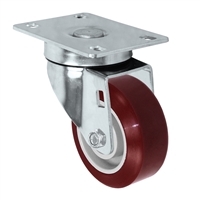 These casters are commonly used in the following industries: food processing, food service, laboratories, hospitals, institutions, pharmaceutical plants, and other applications that require casters to be washed down and cleaned on a frequent basis.